One of Britain's rarest and most attractive small birds has started breeding again in Cornwall. The cirl buntings were brought back to the county as part of Europe's first songbird reintroduction programme. More than 70 of the chicks were hand-reared by experts from Paignton Zoo before being released into a secret location last year. Only one pair of the birds has bred so far, but the RSPB expects there will be more chicks over the summer. 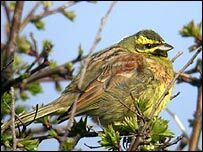 The UK population of cirl buntings declined to 118 pairs in the late 1980s because of loss of habitat from changing farming practices and the species was confined to a narrow strip of south Devon. The hand-reared chicks from Paignton Zoo were collected under special licence from nests in the area before being released on farmland in Cornwall last year. The project was backed by the Countdown 2010 Biodiversity Action Fund, a Europe-wide programme to halt the decline of endangered species. Ian Carter, ornithologist for the government agency Natural England, which administers the fund, said: "Although there have been projects re-introducing larger species such as red kites and sea eagles, this is the first time it has been attempted with a small farmland bird, so it is a groundbreaking piece of conservation work." "We're really pleased that it seems to be on track."